Verdict: 3.5 / 5Whether The Immortal Men will be timeless is up for debate, but there is a lot of work still to go before these characters resonate with readers. James T Tynion IV continues work on The Immortal Men by continuing to set out this brand new section of the DC Universe, of course linking it back to the exciting Dark Nights: Metal run. Featuring the aftermath of the attack on Caden Park, The Immortal Men #2 does a good of adding to the initial narrative, if not answering many of the questions readers had. Following on directly after, the Bloodless, at the control of Kill, attack Caden Park and the Immortal Men come to the rescue. We are swiftly led through a series of emotional beats narrated to us by Reload. Learning a little bit more about the power set of each of our new heroes, as well as Reload’s background as one of the most sufficient Immortal Men, although with the loss to match his skills, the title continues to do a good job of introducing us to the characters involved. 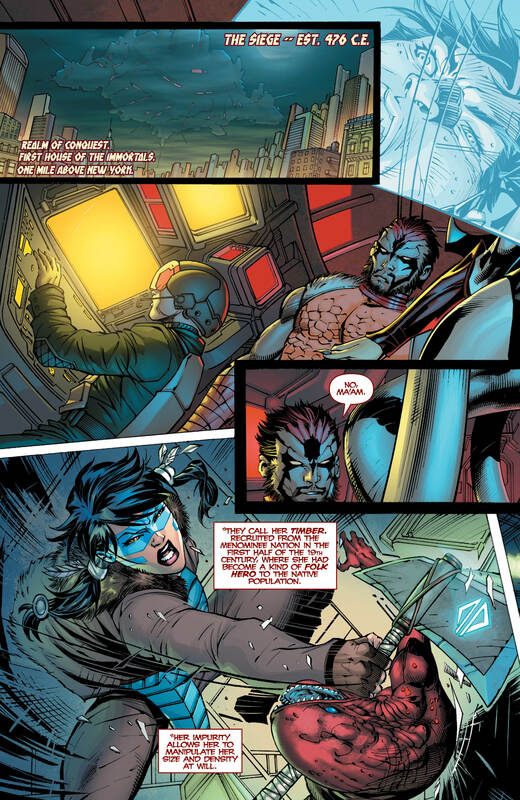 Including looser ties to the grander DC universe once again, including a mention of A.R.G.U.S. and the Justice League, The Immortal Men #2 des well to remind us this is part of a larger world. The Immortal Men #2 des well to remind us this is part of a larger world. 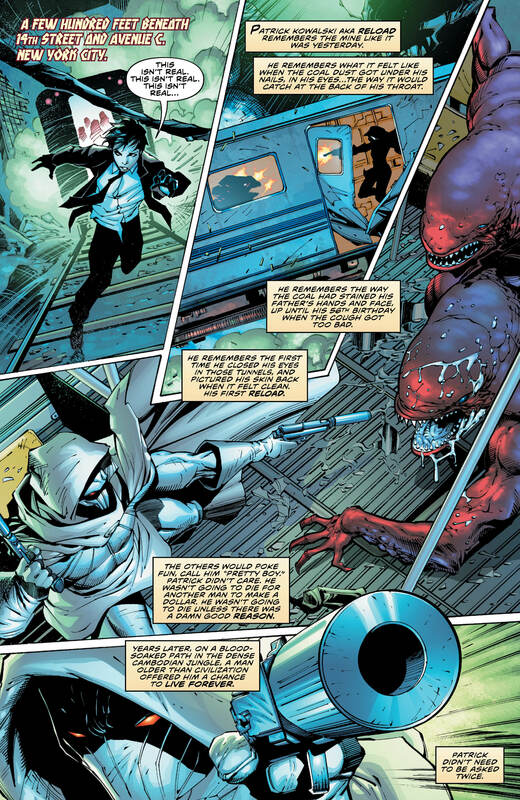 This issue did not, however, delve into how Caden can help, nor why he is being hunted. Whilst the emotional core rested more with Reload this time around, the loss of Caden’s parents set up higher stakes for the young boy. Feeling a little overdone on the lost parent’s origin trope and rushing through the impact of the deaths of his beloved parents, the issue tried to force fun at the expense of a moment of sorrow. What’s more, a few extra pages to The Immortal Men #2 may have done wonders for the overall pacing and allowed for these deaths to resonate a little more before moving forward. The interaction between the Immortal Man and Caden was also very brief and a little confusing, but we may find out more about Caden’s role in the grand scheme of things as we move forward. The villains still remain, to me, far more interesting than our Immortal Men, who are plucked from across time and currently still seem one dimensional, save for Reload. Perhaps this was needed in order to move the story along to a showdown with the Infinite Woman and the Immortal Men (although this seems to have come very rapidly), but the issue felt overstuffed and lacking the emotional punch intended. Whilst there is fun to be had with this series and I am intrigued to see where it keeps going, I believe that slowing it down slightly and not overstuffing with potentially necessary but clunky exposition may improve the title somewhat. The art in comparison is of much higher quality and helps to add to the quirkiness of some of the characters. Not loving the Hela rip-off design, but I thought the design of Kill notably was intriguing. The Immortal Men is still treading water as it buys time to cement itself as a series of note, but still features some impressive art and raises more questions that at some point should be answered. By no means should this be a point for readers to jump off, as I believe we are yet to encounter the peak of this series.